And both these images are just from issue #1! Having T'Challa join the Illuminati in the pages of New Avengers will undoubtably boost the characters profile, but Steve is literally turning in the type of take on the character where you wish every issue ended with a tease of a new Black Panther #1 - with Steve in tow! You could have knocked me over with a feather with the disclosure that the Panther had joined the Illuminati. After seeing how dead-set he was against the organization in the first place, I'm more than curious as to why he changed his stance. Yeah I agree Comicsfan - in fact I thought the recap in the first issue where it showed Panther warning the others at the founding moments to walk away and forget they ever had such an egotistical idea really built his character in the Marvel U as a king and a smart man. I don't want to spoil it for anyone so i'll just say that it's a crisis on infinite earth type of event happening where earth is crashing into itself, threatening to destroy the universe. 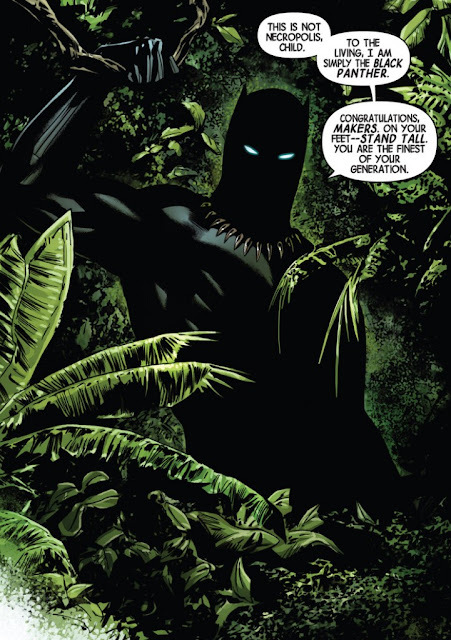 T'Challa and Reed are now spirit connected blood brothers and who else has the equipment to deal with this type of situation? Add in that Thanos is the current big bad guy in the Avengers movie and Galactus is also an adversary of the Black Panther and Mr.Fantastic. It was no way around working with this team.